Why this video doesn’t have more views, I have no idea. How fun it is to hear President Obama talk about the sport. As anyone who discussed Obama’s State of the Union address with me knows, I absolutely hated the speech’s opening in which Obama expressed his own hatred for the bank bailout. I hated it because Obama’s words seemed to me so, so untrue—or at least they should be untrue if he’s at all listened to the economists who surround him—so full of populist pandering. I was glad to hear David Frum echo this point on Marketplace a few days ago, arguing that it the problem isn’t just a lack of conviction but the fact that that absence of conviction will handcuff the government when it comes to pushing any sort of difficult, currently unpopular long-term policy. Why do drugstores and gas stations appear in clusters? Marketplace covered the acquisition of Duane Reade by Walgreens and suggested that drugstores in New York are on nearly every corner because consumers seek convenience. That’s true, but to really understand why they are all over, you need to understand a little game theory. Presh over at Mind Your Decisions has a very simple explanation of why competing gas stations are found across the street from each other and, similarly, why political candidates tend to be centrists. Why should underdogs take big risks? 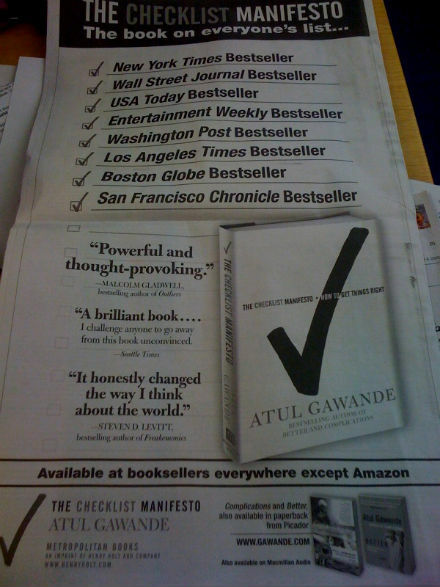 Macmillan ran an ad for The Checklist Manifesto in yesterday’s New York Times and took a shot at Amazon. Cheap? Charles Petersen’s article, In the World of Facebook, in the New York Review is probably the best essay I’ve read about any tech company in the past year or so. Get ready to give 90 minutes of your life right now. 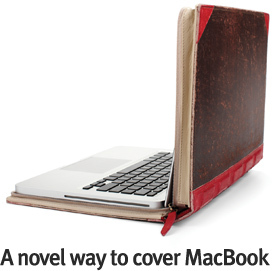 Clearly, you want the BookBook from Twelve South.